Disaster Insurance: Does Your Homeowner Insurance Cover Flood, Hurricane, Earthquake, and Tornado? 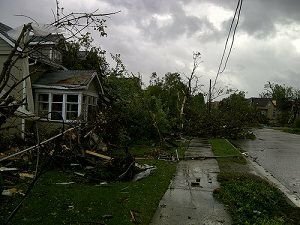 Home » Insurance and Risk Management » Disaster Insurance: Does Your Homeowner Insurance Cover Flood, Hurricane, Earthquake, and Tornado? When you talk with a lender about getting a mortgage on a home, one of the requirements you will discover is the need for homeowners insurance. This insurance covers your home in the event it is damaged in a storm or due to a fire. The lender requires you to hold this insurance because they own 80% (or more) of your property, depending on how large of a down payment you put down on the property. However, your homeowners insurance coverage does not cover every type of disaster that can impact your home. Most policies do not cover a wide range of potential dangers to your home. Think your homeowners insurance has you covered? Think again. Check out these categories of destruction that are probably not covered on your current policy. When water gets into your home, a cascade of bad things happen. Wood becomes warped. Carpet is ruined. Walls rot, and then worse yet, deadly mold can develop in hidden areas. Water inside the walls of your house is a very expensive problem to fix, one that many insurance companies do not want to cover. Your need for flood insurance is usually determined by whether or not your home sits in a floodplain. If it is, you will be required to purchase a separate flood insurance policy before you close on the home. A different type of water damage, but one that is usually not covered under many regular homeowners insurance policies. This can cause similar damage as flooding inside your home, depending on how bad the backup is and how long it lasts. Many homeowners insurance policies will cover wind damage, but balk at paying for rain and/or flood damage from a result of storms. You need to read your policy very carefully before making a decision on additional insurance coverage. Even some hurricane policies restrict damage to just that is caused by wind, not by rising flood waters. Read the fine print carefully. Earthquakes that cause significant damage have traditionally occurred in the western United States. Does everyone need an earthquake insurance? As recent seismic activity has shown, these natural disasters can happen almost anywhere. If your policy doesn’t cover earthquakes and your area is hit by one — even as unlikely as it might be — you won’t be covered. A tornado is a natural disaster of high velocity winds. Thankfully, your homeowners insurance coverage almost always covers damage from winds and hail. You should not need to purchase additional coverage for tornadoes. If you live in an area with a higher chance of tornadoes, be sure to check with your homeowners insurance company to make sure you are covered. While many “normal” homeowners insurance terms specifically write out certain causes for damage such as earthquakes, that doesn’t mean you won’t be able to purchase insurance from the company. The coverage will just be set up as a rider (e.g., additional option) to your current policy, or as a separate policy. Not every company will provide insurance coverage for the disasters you want to cover, so you may need to seek out a different company for your specialized policy. If your current insurance company can’t offer you a policy to cover a specific disaster, you can keep your insurance with them while seeking out coverage from a different company. Start with quotes from major insurance companies, but be sure to also check with specialized firms that offer coverage just for certain disasters. If you are having trouble finding insurance the government may offer coverage for you. One example of this is from FEMA’s National Flood Insurance Program. Your policy costs will be determined by your flood zone, your deductible choice, and the value of the insurance you are requesting. I am sure most people living in Virginia did not think about earthquakes until a couple of weeks ago. If lived in an area that was prone to a particular disaster, I would make sure I had insurance. Very timely article. My brother is my insurance agent and as soon as I read this article, I gave him a call and fortunately my homeowners insurance covers these type of disaster.